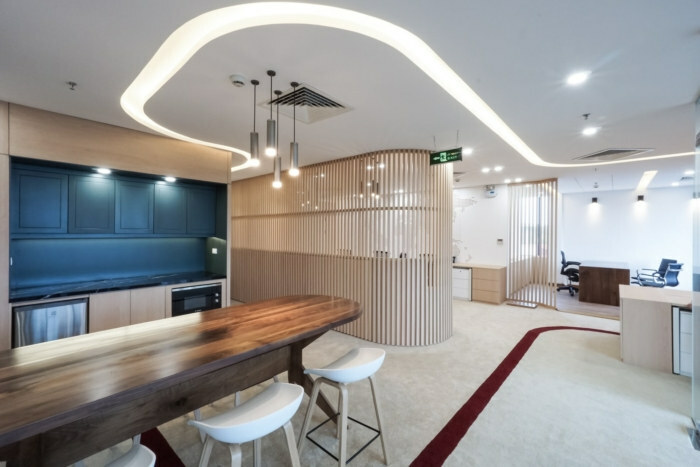 D+ Studio has used a simple and basic approach to design the offices for Merita Capital, an investment fund management company located in Hanoi, Vietnam. We received information from our client by a description of the desired space. The space is not big, but it must creates the connection between people, and the most important thing is to express company spirit. To achieve this, we began by dividing the function with straight lines, then connecting the spaces together with a guiding line for the entire space. The entrance is covered by a wall with the logo. The guiding line starts from here, In order to make the impression and visual effect stronger for a small space which is less corners to work with, we have created an opposite path on the carpet floor. Shoe cabinet system is arranged along the access corridor, and is completely hidden in the wooden wall system. Due to the small space, all functions are calculated at the appropriate level for all employees. The interesting thing after finishing the project, is that the curves, the top and the bottom are joined together, and produce interesting angles view from any direction.